Virginia Gov. 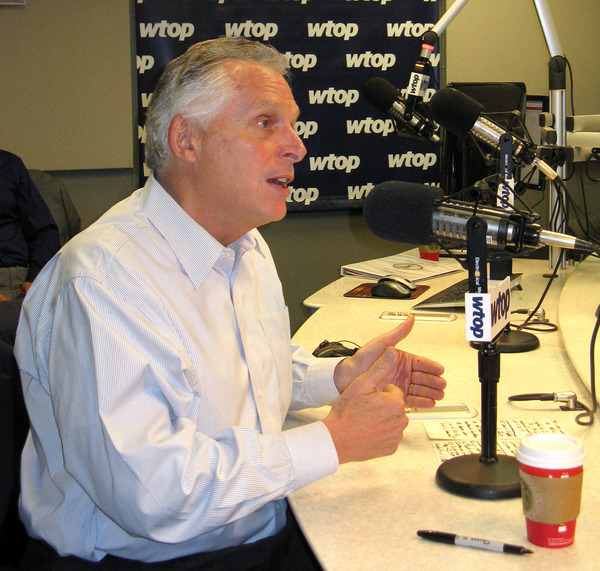 Terry McAuliffe joined WTOP Tuesday, Nov. 24 for "Ask the Governor." WASHINGTON — Virginia will extend express lanes along Interstates 95 and 395 to alleviate bottlenecks at both the northern and southern ends of the commuter lanes providing drivers a straight shot from Stafford County to the D.C. line, Gov. 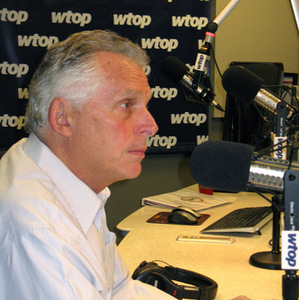 Terry McAuliffe announced Tuesday on WTOP. 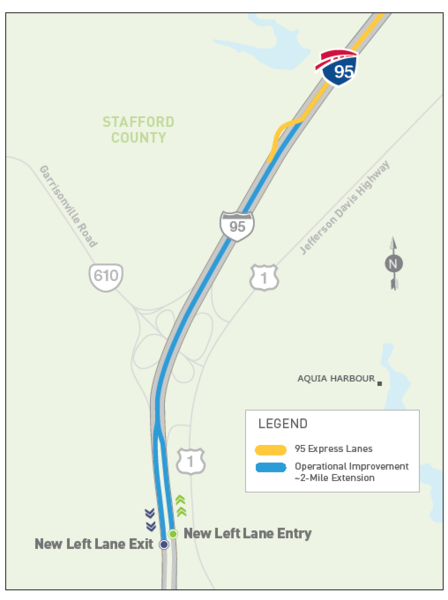 McAuliffe said the state will extend the 95 Express Lanes 2 miles deeper into Stafford County in order to separate through travelers from drivers exiting onto Garrisonville Road. The current configuration has created backups as all express lane traffic is forced to exit into the main lanes just north of the exit for Garrisonville Road. Once completed, through drivers will have one lane to use before merging into the main lanes south of the interchange. Northbound drivers will also benefit from the extension and will be able to access the 95 Express Lanes south of the interchange during morning rush hours. Virginia House Speaker Bill Howell, R-Stafford, praised the improvements and had been lobbying for the changes. "I am confident this project will substantially improve access for Stafford area residents," Howell said in a statement. Construction is expected to begin sometime next year and will take two years to complete. News of the extension comes on the heels of a similar announcement Friday that the state will also extend the express lanes 8 miles on Interstate 395 through Arlington County to the D.C. line. And a third lane will be built - adding needed capacity along a congested stretch of interstate near the Pentagon that is considered one of the worst choke points in the nation. "That's great news for commuters, all of you in Northern Virginia," McAuliffe said of two projects. The project will allow both single drivers and high occupancy vehicles to remain in the lanes all the way to the Potomac River. Currently the lanes revert to HOV only from Edsall Road to D.C. during the rush hour. McAuliffe said plans have been in the works for more than a year to extend the express lanes through Arlington County, which sued the state and halted the toll lane project at its border. Arlington County has not yet formally weighed in on the project, said outgoing Board Chair Mary Hynes. But the proposal does appear to address some of the original concerns that sent the county to court like performing an environmental assessment and generating revenue to provide transit and multimodal options. She hopes that the state will listen to concerns and feedback from the county and residents, like it has on the proposal to add tolls along Interstate 66. Construction will begin in 2017 and take two years to complete. Transurban, which built and now operates the express lanes, is expected to complete the work under its existing contract with the state. McAuliffe said that he would veto a bill barring the resettlement of Syrian refugees in Virginia. He said such a bill would fly in the face of federal law, which gives the federal government sole authority over refugee placement. In the wake of the Paris terror attacks, governors across the country including Maryland Gov. Larry Hogan have said they would not accept Syrian refugees into their states for resettlement out of concerns that militants could be among the new arrivals. But McAuliffe said they are merely posturing for political reasons. McAuliffe has stayed largely quiet on the issue and previously released a statement through his spokesman that refugees undergo intense scrutiny and that precautions are taken to ensure the state's security. "There is not a single thing that a governor can do," he said. Last year the state accepted 25 Syrians — about 1 percent of all refugees — after they had gone through 18 to 24 months of security screenings. No Syrian refugees are currently in the pipeline to come to Virginia, McAuliffe said. The state accepts about $11 million a year in federal funding to help resettle refugees. Some of those funds pay for a state employee to keep track of who they are and where they live, he said. "I think taking that $11 million keeps us safer because we know which refugees are in our state. ... To forfeit that and lose control and knowledge, I don't think keeps us safer." McAuliffe also said there are no specific threats to Virginia. D.C. and other major cities are under heightened alert since police in Europe have uncovered plots for more attacks in Brussels and in Paris. And Monday the State Department issued a worldwide travel alert because of increased terror threats. "I am very confident that we are very safe and secure in the Commonwealth of Virginia. I'm comfortable." McAuliffe also gave an early look at the contents of his new two-year budget, which he'll present to lawmakers next month. His top priority will be to modernize public education so that students are prepared for jobs of the 21st century. "We really are going to shake up how you deliver education," he said. He cited dropping numbers of teaching staff, higher enrollments, larger class sizes, rising numbers of students leaning English as a second language, and unwieldy state standardized tests as concerns he'd like to address. "Our education system was built for the industrial revolution. We are no longer in the industrial revolution. Those jobs that we prepared our students for, what worked 10, 20, 30 years ago is not applicable today." His budget will ensure continued funding economic development and would expand the state's Medicaid program — a policy change that lawmakers have previously rejected. Correction: In a question to the governor, WTOP incorrectly stated how many jobs were created in Virginia last month. According to the Bureau of Labor Statistics, the state created 11,900 jobs in October. Thanks for all who joined us. That's it for today. We'll post a story and the full audio shortly. Constantly blaming the other political party is not a solution either. You were not elected to be a dictator like you and Obama seem to think you are. Anyone elected is there to serve the citizens regardless of whether we vote for you or not. Submitting one plan on I-66 and trying to pass it off as the only viable solution is pure insanity. Tolls don't solve the problem. If tolls were a solution there would be one on every road, street and cul-de-sac in the Commonwealth. So far, you seem to be the first Governor, Democrat or Republican, in a very long time that cannot work with General Assembly to accomplish anything. Why do you think you are having such a hard time reaching across the aisle to get things done. The Governor is incorrect. The Constitution has nothing whatsoever to with the Refugee matter. The controlling law is the Refugee Act of 1980. That legislation was another of Sen. Ted Kennedy's contributions to undermining our national sovereignty. The UN High Commissioner of Refugees selects the ones chosen to come here. State and HHS administer the program through nine contractors. It is a bad law and passed before anything like this threat existed. What Congress has done it can un-do. And his protestations to being powerless is another attempt to duck responsibility for keeping his constituents safe. Appalling. I would appreciate hearing the Governor comment further on his trade trip to the Middle East. Why did he not include Israel in the list of places he visited to build trade? Did he not go to Israel and if not why not? If your top priority is education, why can't Fairfax County get the budget it needs to maintain its record of stellar achievement? What's your plan to 'shake up how we deliver education'? Schools, Education, Money. Loudoun County is developing plans to move middle school students to high schools as a result of the increase in the number of students in the county. This is a result of the rapid growth that is seen in Northern Virginia. The area is experiencing significant growing pains that include overcrowded schools, jammed roads, and challenges with the infrastructure. How is the state involved in assisting Northern Virginia in managing this growth and is there anything specific the state can do to provide additional assistant to these counties? Governor, saying that you cannot do anything about refugees one way or another is a cop out. Please simply state your position. If given the choice to take the Syrian refugees in, would you take the opportunity to prevent them from being settled in Virginia or welcome them with open arms? Do you feel this country, this state, should take the risk right now? If federal law is so clear, why do so many states NOT comply with federal law on illegal immigration and sanctuary cities. IT also appears that the gov is discounting legitimate fears people have. On a final note, the governor says Virginia hosted the first ever Thanksgiving dinner at a plantation in Charles City County - two years before the pilgrims arrived. Medicaid expansion: It'll be in his budget. Will bring more than $2 billion back to Virginia and save hundreds of millions in the budget, make the state more competitive. Rural hospitals are losing money and will lose even more unless the state expands the Medicaid program. He hopes lawmakers will be willing to keep an open mind and at least discuss it. The savings from expansion will help fund other programs in his budget, which he'll introduce next month. Education is at the crux of economic development. Businesses want to know they will have a workforce to hire from in 10 or 20 years. 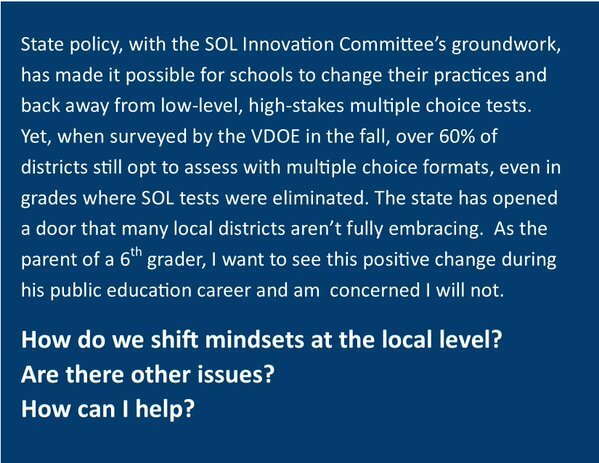 On SOL: Kids being taught to memorize and teachers are teaching to the test. You want students who can think critically, analyze a problem and come up with a solution as an adult employer. Hard for teachers to teach chemistry with a class of 34. Class size is an issue, especially in STEM classes. Says he wants to "shake up how we deliver education." His top budget priority will be on K-12 and providing more teachers, looking at teach pay raises, what he calls "strategic investments." He also wants to revise the SOLs - "Third graders should not be taking 6-hour reading tests." Other priorities will be veterans and economic development. So there's a plan to fix the bottleneck created at Garrisonville Rd by the HOV lanes - the one that any competent engineer wouldn't have created in the first place. Isn't that just wonderful. Has the state looked into mass transit options for Northern VA congestion? Something like light rail or commuter buses to get local commuters off the roads? Routes that end in fairfax city, herndon, reston, tysons corner. Caller states the governor is for taking the refugees: "My point is: I have no say in the matter - it is federal law." He was elected to create jobs, yes part of his job is to keep the state safe. He would veto a bill that banned Syrian refugee resettlement. He's not going to spend his time fighting federal law. Refugees would still come, we just wouldn't know about it. Federal government provides funding to helps states, local governments resettle refugees. If the state won't accept the $11 million, the feds turn to non-government organizations. They can bring the refugees in and the state doesn't know who is here or where they are being sent. On to resettling Syrian refugees and why he supports it: Federal law dictates the resettlement process. Nothing he can do as a governor. I'm confident that we are safe and secure in Virginia. Says that lawmakers are posturing on this issues. Virginia has had 200 refugees per year - from all over the globe - that included about 25 Syrians. Screening takes 18 to 24 months. We have no Syrians in the pipeline currently. @WTOP #askthe Are you going to include the Secretary of Education's proposal for funding Governor's schools in your budget? When will solar leasing finally reach VA? DC and MD are far ahead on this! What is your plan to eliminate the threats and violence in PD 16 schools. Are you planning to institute for training for families on crisis management or for school administration to learn more techniques to desculate inappropriate behaviors. Re congestion on 395 and points south on 95, is there any discussion on starting ferry service on the Potomac in order t e people off the roads? The Staten Island Ferry is old, old, old and it still works moving thousands of people a day. On threat of terror attack of Virginia: He and his administration works with federal partners to keep up with risks and threats. Says he feels confident that the state is prepared and doing everything necessary to keep residents and the numerous federal defense and intelligence facilities safe from attacks. Mr. Governor. Why would the Commonwealth Transporation Board hold a meeting with Tolls in Northern Virginia on the agenda, all the way in Virginia Beach, unless they were only attempting to avoid the growing opposition and why is the location for the Dec 8 meeting NOT on the website, yet all other meeting locations are? The General Assembly says they'll pass a bill blocking tolls on I-66. Will you veto that bill? I would be interested in the governers view on the proposed gas pipeline in central Virginia. I live in NOVA but have property in Nelson Co and it is generating quite a stir. Does the governor support this energy pipeline? Also, a year or so ago, a train with flammable crude oil derailed in Lynchburg, what safety improvements have been made and what additional actions will be taken to prevent these incidents. Given the increased use of drones, what is being done in Virginia to ensure they are used safely? Can you guarantee the safety of Virginia Citizens against terrorism, given your support for importing more Syrian refugees? Will you accept responsibility for any who may wish to do us harm. Approximately 70% of them are "military age men" according to the UN. President Obama recently quipped that people concerned about taking in Syrian Refugees are afraid of 3 years olds. Those of us concerned are not worried about the 3 year old, we are worried about who comes with that 3 year old, it’s father, it’s mother, it’s older sibling. Since you are not willing to protect the people of the commonwealth by implementing the safeguards the majority of governor’s in the country are seeking, are you prepared to take full responsibility if a Paris style attack takes place in Virginia by any of the people you want to take in as a Syrian refugee? We have a crisis today on transportation. 66 is gridlock. Elections have consequences. I have a plan, if they have an alternative, he'd love to see. Constant stance of saying "no" has gone on for years in Virginia. Transportation mess and the cost of sequestration has hurt Virginia's ability to compete economically. HB 1 would prohibit tolling on I-66. All he can do is lay out solutions. "Republicans have no plan." What about tolls elsewhere in Virginia, why just in NoVa? Good question. Transportation agency in Hampton Roads is also looking at the possibility of using tolls to pay for projects there. Mid-Town Tunnel project included tolls. Tolls were too high - he eliminated tolls on related roads, bought down others. This is the only interstate in the U.S. that limits access during rush hour. He's trying to come up with solutions to congestion. In Hampton Roads, adding lanes to I-64. Shovels are in the ground there to address congestion there. On widening I-66: Lets look at the options before spending $100 million of taxpayer money. On to I-66: Says the fight with Republicans over tolling a portion of 66 was just politics. Republicans have offered no real solutions. He's trying to offer solutions. (Mentioned that the 395 express lane extension will add capacity. ) Fight over 66 has focused on tolling a road without adding lanes. This stretch of road is among the worst bottlenecks in the U.S. - one of three in Northern Virginia. Read that story here. Governor also announces that the express lanes along 395 will be extended all the way to the D.C. line - another 8 miles. Currently that stretch of road in Arlington County is HOV only inbound and outbound, no tolls. That will change with the widening. Single drivers will be allowed to use those lanes but they'll have to pay a toll. Governor announces that the state with help from Transurban will extend the 95 Express Lanes 2 miles south, deeper into Stafford County to reduce the southbound bottleneck that ocurres when the lanes end at Garrisonville Road. When is Virginia going to sign onto the ZERO EMISSIONS MANDATE? Most other states have, including backward thinking places like Maryland and DC? Hello Governor, I want to know why Virginia residents don't have the choice to get solar energy/solar panels? It appears there's a monopoly in the electricity business in the state which is not allowing competition. How much do the current monopolies contribute to your campaigns to keep the solar industry out of the state? Governor, thank you so much for a plan on I-395. Member of Fairfax/NOVAChamber. This will unlock business potential in Northern Virginia. Any chance on exploring a new bridge across the potomac? Good morning! We're about to get started. Post those questions! The governor will be with us shortly. Feel free to submit your questions now. @WTOP @GovernorVA Sir, VA needs $ to build/repair our transportation infrastructure. Why not tolls on I-95, like MD, DE, NJ, NY, to raise $? When will you stand up for Northern Virginia and stop the constant double taxing of this area? We should not be forced to pay taxes and tolls for roads. Toll roads don't solve traffic problems while the rest of the Commonwealth - VA Beach, Chesapeake, etc. get brand new free roads. Our tax dollars should be used to fund our school districts first. When are you going to fight for Fairfax County schools? Fairfax county public school education is a joke, what do teachers do on 'students holidays' and why there are so many of them? The kids are learning nothing! Will y'all ever create jobs people can have locally to cut down traffic problems and can afford local homes going overboard on housing costs? Just read about about what you are doing for homeless vets and just want to say Thank you from TN. Good Job!!!!!!!!!!! Stop any settling of refugees in VA! That's my comment. Why are you willing to risk our safety and security by allowing refugees into our state without any vetting process whatsoever? It would be safer for the refugees as well because we could weed out the people who pose a threat to them as well as us!